HTML Counter "Thomas Jefferson (13 April 1743 N.S. – 4 July 1826) was the third President of the United States (1801–1809), the principal author of the Declaration of Independence (1776), and one of the most influential Founding Fathers for his promotion of the ideals of Republicanism in the United States. Major events during his presidency include the Louisiana Purchase (1803) and the Lewis and Clark Expedition (1804–1806). As a political philosopher, Jefferson was a man of the Enlightenment and knew many intellectual leaders in Britain and France. He idealized the independent yeoman farmer as exemplar of the republican virtue, distrusted cities and financiers, and favored states' rights and a strictly limited federal government. 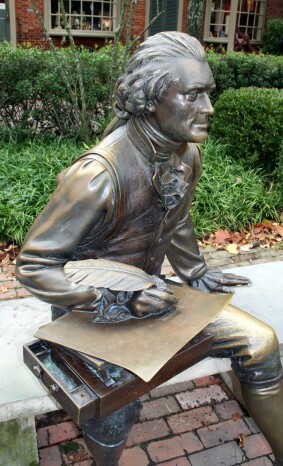 Jefferson supported the separation of church and state and was the author of the Virginia Statute for Religious Freedom (1779, 1786). He was the eponym of Jeffersonian democracy and the co-founder and leader of the Democratic-Republican Party, which dominated American politics for a quarter-century. 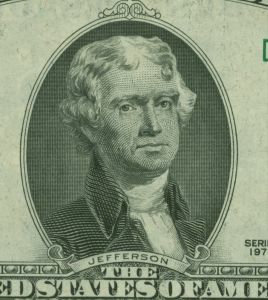 Jefferson served as the wartime Governor of Virginia (1779–1781), first United States Secretary of State (1789–1793) and second Vice President (1797–1801). A polymath, Jefferson achieved distinction as an horticulturist, statesman, architect, archaeologist, paleontologist, author, inventor, and the founder of the University of Virginia, among other roles. When President John F. Kennedy welcomed forty-nine Nobel Prize winners to the White House in 1962 he said, "I think this is the most extraordinary collection of talent and of human knowledge that has ever been gathered together at the White House—with the possible exception of when Thomas Jefferson dined alone."